What Gay Childhood Icon Are You? You Are the Very Gay Peppermint Patty! As well as a "best friend" who loves to call her "sir"
Summer is nearing and that means time for summer blockbusters at the movie theaters. Of all the summer movies I am waiting to see, one is the comedy "Grown Ups." I knew once I heard about the movie I would be going to see it. I tend to like these kinds of raunchy comedies. They showed a preview of this (during "Death at a Funeral"when I saw that one last weekend) and I was already laughing as was most of the rest of the audience that day. I'll be seeing this when it releases on June 25. See the trailer below. I'm also looking forward to the "Shrek" sequel on May 21, and may just re-watch the first three over the next three weeks (I have the first and third ones on DVD). Also going to see the "Toy Story" and "Twilight" sequels. So far these are the only ones I've definitely planned on seeing, but I will be looking out for other possibilities. See this list for month-by-month summer releases. You are cautious and slow to act. It takes you a long time to get used to ideas. You are happiest when you are able to be a lone for a while. You find strength within yourself. You work at a pace that is comfortable to you. You can get more done if you don't burn yourself out. You are a quick moving person. You get through things as efficiently as possible, though you occasionally cut corners. Strangely enough, I have often taken a long time to get used to new ideas. I saw this post on the Got YA! blog and it got me reminiscing about books I grew up with. I read a few that were listed in that post. I loved the "Ramona" books by Beverly Cleary and am waiting to see the "Ramona and Beezus" movie this summer. Yes, I will see another movie based on books, which I already read years ago;-). 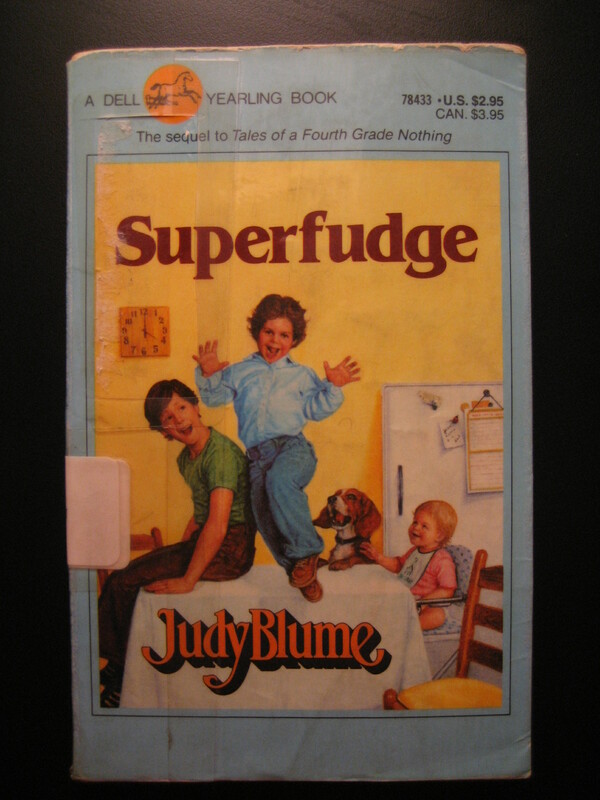 I also loved the" Fudge" books by Judy Blume. I still see and glance at these books at bookstores and a second-hand stores. Same with Blume's classic but controversial "Are You There God? It's me Margaret." Another series of books I loved was the "Sweet Dreams" romance books. I would often buy them back in the 1980s, since borrowing them from the school library was nearly impossible! They were always checked out, seemingly by people who would have never read them if they had to buy them. I only managed to ever check out one of two of them in seventh and eighth grade. Last June, I came across a few of these books at a second-hand store that I never read the first time. There were other teen romance novels I read such as "First Love From Silhouette" books. I liked these as much as the "Sweet Dreams" ones and owned several of the "First Love" books as well. I also recall reading a few other romance novels from series I don't remember the names of. Some others are profiled in this blog post. Some of these sound familiar to me, but some do not. I pretty much gave up these books by the time I was 16. Reading some of them as a grownup, however, brought back some memories and made some new ones from reading the books I missed the first time. I unfortunately don't have any of these books now, but the memories live on. You are funny and playful. You bring out the brighter side of things. You are one colorful character. You tend to go to your friends for advice and opinions. You value what your friends have to say. You have an optimistic take on life. Things are always a lot better than they seem at first. Spending time alone makes you more optimistic and ready to take on the world. You like to recharge. I recently came across this blogpost from Steph in the City and it got me thinking about how many movies I'd seen without reading the book. I left a comment saying how in some cases I was unaware that a movie was based on a book. Two years ago, from Netflix, I stumbled upon the movie "Fast Food Nation." I don't know what compelled me to add this to my queue, but somehow I did. I was totally unaware that there was a book until someone I know said he'd read the book. Similarly, last year, after I saw the trailers on TV for "Hotel for Dogs," I went to see it and I liked it, but once again, I did not know about the book! In these cases, I did not know about the book either, but in the case of the last two, once I became aware of the book, I decided to seek it out and read it. I glanced at a copy of "The Clique" at my town's library, not feeling too compelled to read it all. And I don't even remember hearing about the film "Zathura" when it came out, let alone that I didn't know about the book. I just came across this film somehow while browsing Netflix one day. Something obviously made me decide to add it to my list of films. I received and watched this one about three weeks ago. As far as the "Harry Potter" series is concerned, I did go with my mom to see the first two films in 2001 and 2002, but never read the books. But I've not watched the subsequent movies either. And I'm well aware of the books--I've always assumed everyone was. But were these people? I just haven't been able to get into this series. There are probably others I've seen based on book that I did not know about, that I cannot recall right now. In 1996, when the book upon which this movie is based was first published, it was titled "Push: A Novel." The film was likewise originally titled, "Push: Based on the Novel by Sapphire," but in February 2009, the movie title was changed to Precious: Based on the Novel Push by Sapphire (2009) to avoid confusion with the 2009 action film Push (2009). When the novel was republished in 2009, it was as a movie tie-in edition with cover art from the film, a common enough practice regarding books that have been turned into movies. What is unusual about the movie tie-in version of the book is that the book's title had also been changed to the movie's - which means that the book is now called "Precious: Based on the Novel 'Push' by Sapphire," even though it is the novel "Push" by Sapphire. On the other hand, my mom had the books in the "Twilight" series so I asked to borrow them. I received the DVD, since there were a lot of other films already in my queue. When I saw the book at my place of work, I decided to buy it in hopes of getting to read it before the movie reached the top of my queue. I won a $10 gift card in a drawing work one day and immediately used it to buy the book. I read the book in less than a week in early January, and it was more than a month till I received the DVD in the mail. And I read "Charlotte's Web" many times as a child before I saw any of the film adaptations.